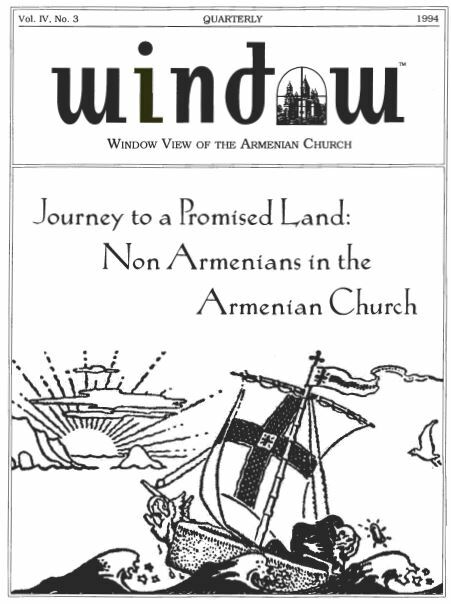 The views expressed in Window are not necessarily those of the Armenian Church hierarchy. Window is known as Loosamood in Armenia. Window is an independent publication supported solely by reader subscriptions. Entire contents ©1994 Armenian Church Research & Analysis Group (ACRAG). All rights reserved. Use of original articles, translations, art work or photographs without the expressed permission of the publisher is strictly prohibited by law. All manuscripts submitted for publication become the property of ACRAG. Subscription information: Send name, address and $22.00 for each subscription to: Window Quarterly, P.O. Box 700664, San Jose, CA 95170. An electronic Version of Window is available on the St. Andrew Information Network (SAIN) System: 1-408-257-1846 or via the internet at acrag@sain.org. Address all correspondence to: The ACRAG. Window is produced on a Macintosh/Apple II system and Laserset on a LaserWriter utilizing the ITC Bookman and ITC Avant Garde fonts. Some of the material used is compiled and prepared utilizing the SAIN electronic forum. Printed in the United States of America by ACRAG Publishing. Window and the logo appearing on the cover are trademarks of ACRAG. Macintosh, Apple II and LaserWriter are registered trademarks of Apple Computer. When Armenians in the Diaspora hear that a non-Armenian wishes to become a member of the Armenian Church, the first question they ask is: “Is s/he married to an Armenian?” If the answer is no, the next question is, “Why does s/he want to become a member of the Armenian Church?” The surprise is increased when the non-Armenian – who is not married to an Armenian – expresses interest in becoming an ordained priest in the Armenian Church. The initial response of Armenians to this is flatter and a sense of validation that their church is so attractive, that even an “objective non-Armenian” is attracted to her. But soon this reassuring feeling turns into concern. Why would a non-Armenian want to become a priest in the Armenian Church? Does he speak Armenian? Does he know Armenian history? Is he familiar with Armenian culture and customs? Would he be able to find a parish who would accept him? Does he have a hidden agenda? Or what…? I know at least of three individuals (there have been many others) who have found themselves in such predicament: a Ph.D. from Cambridge University and a former Anglican priest; a young professional, former Baptist, who has converted into the Armenian Church; and a former Roman Catholic seminarian from Puerto Rico. I have had many hours of conversation with all three of these individuals. The truth of the matter is that the Armenian Church has not articulated a position on the matter and has not faced such a challenge before (at least in recent memory). The issue (or problem) of admitting non-Armenians into the Armenian Church as ordained clergy, re-obviates the fact that the Armenian Church does not have an evangelistic mission, not only to non-Armenians, but to Armenians themselves. The apostolic mission of the church commissions her to preach the Gospel “to all nations,” but the fact remains that today, for numerous unspecified reasons (and excuses), the Armenian Church has failed to preach the Gospel to its own people. (Notwithstanding, the abstract, simplistic and seemingly religious sermons or church publications, which are at best a mere lip service or more correctly, hypocritical). The Armenian Church prides itself for preserving the nation, but never prides itself for teaching the Gospel to Armenians, (that’s the Protestants’ job). What do we mean when we say “the Armenian Church throughout the centuries preserved the nation?” The hierarchy, so far, has not been able to articulate a meaningful explanation of this “phenomenon.” For example, what are some of the concrete things that the church did to preserve the “Armenianness” of Armenians? Was it really the church who preserved the nation or was it something else? The reality of the Diaspora is before us. Second and third generation Armenians do not speak Armenian or do not associate with the Armenian Church or community at large. If the number of church members (dues paying) is an indication, then the church leadership (i.e., hierarchs, clergy, laity) has done a bad job, because over the last five years the numbers have been progressively decreasing. If the number of Armenians attending Sunday worship service is another indicator, then again, the church has done a bad job. (Thank God for Hokehankists). Since the independence of Armenia, we have been hearing, over and over again – by high ranking clergymen and lay leaders – that now the church can concentrate on its “true mission,” i.e., taking care of the spiritual needs of Armenians. However, its been over three years since the independence of Armenia and there has been no sign of the church carrying out its “true mission.” Maybe next year…. It is ironic that non-Armenians – with their interest, zeal and appreciation of the Armenian Church’s rich religious and spiritual wealth – are challenging us to think about the real mission of the Armenian Church to Armenians. Today, the Armenian Church is not called to preserve – the Armenian Church is called to renew, to re-create, to edify . The church is not here to stay – the church is here to walk in the march of history. The church is not called to repeat old rituals for their own sake, but the church is called to pray, with a prophetic voice. This is the real challenge of non-Armenians to the Armenian Church and its hierarchy. Why did you join the Armenian Church? Sometimes my reply to Armenians has been jocular: “The Armenian women’s guild are better cooks than their Catholic or Protestant counterparts.” My occasional glibness has served as a protective cover for the disappointed recognition that many lifelong members of the Armenian Church don’t realize the treasure we have and don’t see the universality of our Church’s mission. It also covers the painful realization that the Armenian Church in North America has not always argued eloquently against those who write it off as an anachronism. The real reasons I joined the Armenian Church have nothing to do with bouregs or baklava. I became a member because: 1) The Armenian Church is part of the true Church and continues to teach the undiluted truth about God and humanity, even if it has sometimes been slow to relate those truths to contemporary social problems; and 2) My Armenian parish lives out the spirit of our faith in a family-like relationship with one another and through hospitality to strangers, like the way I was treated on my first Sunday in church. Let me begin by addressing the first reason. The Armenian Church does not have a monopoly on truth. It is one of five Oriental Orthodox Churches and is closely related to the larger family of Orthodoxy, the Eastern Orthodox. The word orthodox comes from the Greek for “correct opinion,” i.e., truth, and the preservation of truth is the premise on which our view of Christianity is based. How was Christ understood by his apostles and followers and the men and women who succeeded them? The answer lies in Orthodoxy. To those who believe that humanity should continually recreate Christ according to passing whims and fashions, the Orthodox can say nothing. But for those who believe that Truth became incarnate in Palestine at the beginning of the Christian Era, there is no alternative to the Orthodox Church. It is the only institution to preserve the faith of the apostles, neither adding to the Tradition of early Christianity nor subtracting from it. I felt drawn back to Christianity after I was brought to the realization that agnosticism, the tenet of my adult life, provided neither peace of mind nor sense of purpose. But I could not return to the Protestant Christianity of my background. Even as an adolescent it seemed shallow and strangely distant from the world of the Bible. Roman Catholicism was not an attractive alternative. Rome’s positions on the papacy and other defining issues resulted not from theological insight but from an unfortunate chain of historical events. With the collapse of the Roman Empire came a Dark Age in which the learning of the Eastern Mediterranean, Christianity’s cultural matrix, was lost. This left Orthodoxy. I began my journey to the East by reading a book — a Milwaukee Yellow Pages, seeking names and addresses of Orthodox churches — and commenced six enlightening months of parish hopping. Because Armenian Churches are not listed in the phone book under Orthodox but Armenian Apostolic, I almost overlooked them. On an educated guess that Armenians were Orthodox, I visited the Greenfield, Wisconsin parish on Sunday before the earthquake of 1988 (in Armenia). It was not long before I returned. What struck me almost instantly about Orthodoxy was the unique applicability of our time of the liturgy, Byzantine or Armenian. Those who decry it as a museum exhibit are themselves destined for the museum. We are on the road to a “post–literate” society, a visual age in which learning will be accomplished less by the written word and more by visualization. The hour–long sermons of historical Protestantism are not the wave of the future. It is the Orthodox liturgy that has much to offer the children of the video era. The liturgy is a visual and mystical reenactment of the Word, of Christ’s mission, culminating in the Eucharist, the sharing of Christ’s body by his believers. And the liturgy has an advantage that no video has: It is three dimensional, it takes place around the participants in real time. Non-Armenian friends who accompany me to liturgy seem more aware than many Armenians that our ancient rite is as contemporary as today. The same people who snicker at Vatican II “folk masses,” which yoke worship to an outdated musical fad, leave the Armenian liturgy in awe of its profound spirituality. My second reason for joining the Armenian Church was the Armenians I discovered there. For the most part they weren’t scholars who could answer my questions about the Council of Chalcedon. They didn’t need to be. The Armenians I met at that first coffee hour five years ago seemed to live their theology in small acts of consideration and fellowship. It is often through the example of its members that parishes gain new members. It is primarily through them that I became Armenian rather than Greek or Coptic Orthodox. The Armenian Church has a special responsibility to bear witness to Armenians in the homeland and the Diaspora, but is also a component of the One Catholic and Apostolic Holy Church (cited every Sunday in our creed). The survival of Armenian language and culture in North America is a task for the Church but cannot be its main mission. To present ourselves as a cultural organization first and as the Church second will continue to spur the exit of young Armenian-Americans, tired of priests who preach Karabagh instead of Christ, and preclude our spiritual mission to the world. I was shocked to hear an Armenian cleric offer the following reason for maintaining Armenian as the language of the liturgy: “If we do it in English then why wouldn’t people go to the Catholic Church instead?” The answer is that we have much more to offer the world than the Armenian language. The theology of the Armenian and other components of the Orthodox Church answers many questions raised by those who have turned their back on Christianity. I know. I was one of them. Language was not an issue when I joined the Armenian Church. Truth was. I don’t think I am unique. The Armenian Church has a message for Americans, not just for those of Armenian ancestry but people from every country and continent. Our Church must stop apologizing for itself to outsiders and creatively communicate its teachings to our society. Our’s is a Church with a particular ethnic heritage and mission but also a Church whose relevance crosses all borders. The Epistle message, “There is neither Jew nor Greek… for you are all one in Christ Jesus” (Gal. 3:28) applies as well to Hye and odar in one Church. The Armenian Church needs to rekindle the missionary zeal of Sts. Thaddeus and Bartholomew, of Gregory the Illuminator and Mesrob Mashdotz. “Therefore go into the highways, and as many as you find, invite to the wedding” (Matt. 22:9). Dave Luhrssen is a member of the St. John the Baptist Armenian Church in Greenfield, Wisconsin. He teaches history at Milwaukee Area Technical College and writes about music and popular culture for Billboard Magazine and other publications. In July of 1992, former Baptists Tim and Marsha Robinson became confirmed members of the Armenian Church at St. Vartan Church (Oakland, California). Though neither is of Armenian descent, Tim and Marsha joined the Church Choir, became involved in two Church Bible Studies, and the Sunday School. After a year in the Church, Tim, with a Seminary background, felt a call to the priesthood in the Armenian Church. He met with Archbishop Vatché Hovsepian, Primate of the Western Diocese, regarding this desire, and received an initial positive response from the Primate. The following interview probes Tim’s journey to the doors of the Armenian Apostolic Church. Q. Tim, I’m sure you’ve been asked this before: What brought you and your wife Marsha – Christians who are not of Armenian descent – to the Armenian Church? TR: Marsha and I were raised as Fundamentalist Baptists. I would say that for a variety of reasons, we grew weary of that tradition. (I don’t want to be too negative; there are things I truly appreciate about my background.) After I graduated from seminary, and after an abortive attempt to get into full-time ministry, we drifted away from the Baptist Church and we didn’t know where to turn. Frankly, we just put church and God on the back shelf for a couple of years. But we couldn’t live that way. Speaking for myself, I felt an enormous loss, a “hole” in my life without God. I began looking for a way back to God and to the Church. About that time, a member of the local Armenian Church dropped into Xerox (my former employer) shopping for a copier for the church. We discussed copiers for a few minutes and spent almost an hour talking about the church. The member was the Parish Council Chairman of St. Vartan and former Diocesan Council Chairman of the Western Diocese. He was a wonderful ambassador for the church and invited us to attend services. We attended a few weeks later. We have been going ever since. We weren’t serious at first about becoming Armenian Orthodox or joining the church, but we enjoyed it and kept coming. The pastor, invited us to attend a church Bible study. This was shortly before Easter, so we also attended the Holy Week services. The more we attended, the more we talked and read, the more both Marsha and I became convinced that this is where we wanted to be. In July 1992 – after attending St. Vartan’s for six or seven months – we were confirmed in the Armenian Church.. Thus far I have no regrets, except perhaps that I didn’t find the Armenian Church earlier in my life. Q. What is your early religious and spiritual background? TR: Both Marsha and I were raised in very religious families. My parents are devout Baptists. They prayed for my birth (almost a parallel to the Samuel’s story) and dedicated me to God’s service. At five years of age, I made the expected public profession of faith associated with baptism. Even as a small child, I felt a deep sense that God wanted me to serve Him. When I was asked about what I wanted to be when I grew up, I would usually announce that I wanted to be a “pastor.” I was brought up in Sunday School. I participated in church youth groups, led worship and did a lot of personal evangelism. I was at church all day Sunday and two nights a week. I wasn’t a particularly rebellious youth, but as a teenager I resented the church’s restraints. My relationship with God wasn’t the best. However, when I was 18, I became involved in a home Bible study that my father was leading. As we studied St. Paul’s Epistle to the Romans, I embarked on a voyage of self and God discovery. I began to see my own responsibility for my sin. I had acknowledged that in the past, but in my muddled teenage mind I blamed others for my shortcomings. And I had gotten to the point that I would bargain with God – “I will perform these religious duties, and you will leave me alone or perhaps bless me in some way.” I realized once again that I was a sinner and needed to repent — no matter how much work I did for God, He owed me nothing. I renewed my dedication to God. Q. How did this experience, this re-awakening, effect your life? TR: Immediately after high school, I attended a small Fundamentalist Bible College. I wanted to understand more about my faith. I wanted to understand God, the Bible and what being a Christian was really about. My one year of Bible college was a terrible disappointment. I wound up more confused than enlightened. So I enrolled at San Francisco Baptist Theological Seminary as a special student for two years, taking the normal battery of graduate level classes, including Greek and Hebrew. The seminary was very conservative, but I benefited from my studies. After two years, I decided to return to college to finish my undergraduate degree. I went to California State University at Hayward and graduated in 1980, with a B.A. in English. Q, Where did you finish your Seminary study? TR: I received my Master of Divinity degree from Western Baptist Seminary in Portland, Oregon. Western was a more broadly “Evangelical” school, a place where I could expand my theological understanding. At Western I first became aware of and sympathetic to other schools of theology, including Orthodoxy. Two elective classes especially made me more cognizant of the Orthodox position: the first was a class in the History of Christian Worship. By the end of the course, I found myself becoming much more liturgical — I wanted to hear the Creed, to say the Lord’s Prayer, etc. Ironically, my beloved professor was an Armenian Baptist! I also took a class in Historical Theology. Since the professor specialized in the Early Church Fathers, we concentrated on the Pre-Nicene through Pre-Reformation period. I discovered the Apostolic Fathers, St. Augustine, St. Clement, etc., and I realized what gaps of attitude, style, and thought lay between them and myself. By the time I graduated from Western, I had concluded that Baptists were just another Christian sect, that there was nothing particularly “right” about being Baptist. Q. What did you do after graduating with your M.Div.? TR: After an ill-fated attempt to become a foreign missionary, I took a job teaching Sophomore English and Special Education at a Christian High School. I also worked part-time at a small Baptist Church. After some time, however, with school loans coming due, it became financially imperative that I find other work. So I began working for Xerox. Sadly, when I left my teaching job and my ministry position, I closed the Bible, closed the door of the Church, and didn’t go back for several years. We attended churches near us, but we did not want to get involved. During the next four years at Xerox, I poured myself into learning all there was to learn about corporate life, sales, and marketing, and I tried to forget about everything else. I didn’t abandon Christianity altogether or my Christian moral positions, but I couldn’t commit myself to church for awhile. When we went to church, we would go to an inner city Charismatic church near us or to the Roman Catholic Church down the block or to the Greek Orthodox Cathedral. Q. What made you decide to join the Armenian Church and not another Orthodox Church? TR: Marsha and I truly believe that the Holy Spirit has led us to the Armenian Church. For us the Church is a spiritual refuge. We were like weary people wandering through a maze, a wasteland of spiritual chaos, looking for help, looking for direction, and God brought us to the Armenian Church. We have certainly visited other Orthodox churches, and we have formed friendships in those churches, but we prefer the Armenian Church. Let me make just a few observations here about the American church scene. Americans frequently “shop” for their churches the way they shop for their clothes: “They have a nice pastor, but they don’t have a nursery. Oh, this church has such a nice music program; let’s go here for a while!” There is in American religious thought an ethos of radical individualism, a sense of rootlessness, a lack of commitment — Americans typically form weak ties to their churches. In America, you’re not married to your church, you’re “just living together.” If you have a serious argument with your church, it’s time to split. This fits very well with American ideals and notions about personal freedom. But Orthodox churches in general, including the Armenian Church, have a better vision of the Church. The Orthodox understanding is real, organic, doctrinal, confessional UNITY. We can’t always pull this off, but at least the vision is there. I appreciate the organic tie Armenians feel to their Mayr Yegeghetzi. The Armenian Church has problems, just like any church. Marsha and I see that, but the Armenian Church holds strongly to the Apostolic Tradition. The Armenian Church has been very satisfying to us spiritually in a way we have never experienced before. The more we learn about the Church’s Tradition, the more we appreciate it. And we are coming to this as seasoned believers who have experienced almost every form of Christian worship and are aware of the pitfalls that can beset a church and its people. Q. When did you start to think about priesthood in the Armenian Church? TR: As I mentioned, I felt the call to ministry in my life when I was very young. Every Christian is supposed to make certain commitments to Christ and to His body the Church: commitments of time, participation — first level commitments. Everyone is supposed to be a “minister” in that sense. The church also has always acknowledged other levels of commitments: the orders, monasticism, professional ministry, teaching. I’ve always felt a distinct call to this kind of ministry. Being involved in the Armenian Church revived that call. I’ve always been a little hesitant about being a pastor, but I no longer feel that hesitation – it’s what I desire. I’ve never been so willing to take that step, to say “yes” to the call. God has finally brought me to where I am single-minded in my ambition. Let me add that I also have developed a keen new sense of my unworthiness for this holy work. God has lowered me a few notches from where I was right after I graduated from seminary and thought I knew “absolutely everything.” I realize more and more my inadequacy and the necessity of God’s grace. Q. How have your family and friends responded to your becoming an Armenian Orthodox and to your call to the priesthood? TR: Our non-Armenian friends, including the people with whom I attended seminary, have all been fairly accepting of our involvement in the Armenian Church. They may not know what “Armenian” or “Orthodox” mean, but they are open. Marsha’s family was quite accepting. My father, a life-long Baptist with a typical anti-Roman Catholic bias, had some reservations: “Looks and feels Catholic. Must be wrong.” Poor Dad! He prayed for me and wept for my soul when I wasn’t in church, and when I finally did go back, I wound up in something utterly unknown to him. He informed me that he wasn’t sure that I was still a Christian! After a number of conversations, I convinced him that I was indeed following Christ. He still has his doubts about my being a priest in the Armenian Tradition, but he prays for me anyway. Marsha is extremely supportive. Q. What is the experience of the Armenian Badarak – the Divine Liturgy – like for you? TR: I feel at home in the Badarak. What I especially like about the liturgy is that it seeks to incorporate the whole person – physical, spiritual, intellectual, emotional – into one experience. God speaks to me in that liturgical framework through the joining together of matter and spirit, just as we as humans are a combination of those two elements. In traditional Baptist churches, worship is essentially a lecture or business meeting with hymns and an offering – everything is cerebral. It is more of an assembly to talk about God, sing about God and every once in a while talk Him to make sure He is still there. There is little emphasis on direct experience with God. In the Armenian liturgy there is the sense of standing before God Himself and addressing and worshipping Him – singing to God, praying to God as a unified community. Participating in the Badarak means participating in something larger than yourself, beyond your parents, beyond your own baptism. It’s a worship service that connects you to Christians of every age. We were surprised that so many Armenians are in the “worship grandstands” in the congregation. They seem afraid to participate, to sing along, to enter in. The people are actually apologetic about the service. They complain: “Tsk! So long and in Classical Armenian.” Growing up in the American Fundamentalist movement, we grew accustomed to a tremendous time commitment throughout the week. Members are expected to be at Church for Sunday School (God forbid you should be late! ), Church service (typically 3 hours combined with Sunday School), Sunday evening service and then prayer meeting on Wednesday night, plus Bible study or visitation on Thursday. The Badarak isn’t too long. And Armenian isn’t that hard. It is important to understand what is happening, “worshipping God with my mind,” as St. Paul says, so even though I am learning Armenian and learning the Badarak, I always follow along in the liturgy translation. Q. As a “non-ethnic” member of the Armenian Church, how have the people responded to you and your wife? TR: Overall the people we’ve encountered in the community have been positive about our membership. Many are curious about how we got here and why. We tell them frankly that we were looking for a spiritual home, and the Armenian Church gave us what we were looking for. Q. What particular challenges do you see in your involvement in the Armenian Church? TR: On the practical side, the language is a challenge. We realize the absolute necessity of becoming as fluent as possible in the Armenian language. It’s a challenge that can be accomplished. It is perhaps unusual for a non-ethnic to feel at home and to be called to service in an ethnic church. This is not the church of my ancestors — most were either Protestants or Roman Catholics. My situation is that of the adopted child: I am not here because I was born into the church. I am here because I choose to be here — or I should say, God chose to put me here. In many ways my situation is a reflection and a result of the Armenian Diaspora. The Diaspora, especially here in America, is after all firmly entrenched. Most people here are not going to move back to Armenia, and by way of intermarriage, there are more and more non-Armenian members in the church. Archbishop Vatché’s affirmation of Marsha and me is a word of encouragement to non-Armenians who are part of the community. It is, I think, an affirmation of our legitimacy. I think our Archbishop is quite courageous in accepting us. He is taking a great step of faith, perhaps in remembrance of the fact that not all early leaders of the Armenian Church were ethnically Armenian. If you are a member of any church and you feel a call to service, there should be some way for you to express that call. If you are restricted because of your heritage, then the Church is saying that it is a church for only one sort of people. This is, I think, distinctly apart from our Christian ideals and a situation in which the Church loses out on a potential ministry. Let me also emphasize that I am not here to teach the Armenian Church or to set the Church right. I came as a seeker and a learner. I do not want to see the Church become more Protestant or more Western. God forbid! If anything, I would like the Church to become more Armenian! We meet Armenians who want the Church to go in half-a-dozen different conflicting directions. I suspect that many of those directions will lead to at least a loss of identity or even to destruction. Copying some other church’s forms and philosophies means borrowing that church’s problems as well. What if the Armenian Church were to recapture its own tradition and roots? We all say that the founders of the Armenian Church were wonderful people, but if we really want to honor the Church fathers and mothers, if we really want to claim St. Sahag and St. Mesrob, St. Vartan, St. Santooght, St. Nersess Shnorhali as our ancestors – physically or spiritually – then shouldn’t we seek to imitate them? What made them great? Prayer, devotion to Christ, sacrifice, love, humility, doctrinal purity, love for the Scriptures, dedication to the Apostolic Tradition. We can be the same kind of people today. We have the same power – the Holy Spirit. We have the same Sacraments; this is essentially the same Church. We just lack the will and the faith. And I think we are too easily distracted by the idolatry and materialism around us. We lack the conviction that all Saints seem to have had: that Jesus Christ is the only answer to life, that no one else has any real answers. TR: Testing and blessing! Archbishop Vatché has given me his blessing to pursue my studies toward the priesthood, in the Fall of 1994. I am studying Armenian, working in the church, serving on the Parish Council and working on taking care of practical matters: passports, consolidating personal effects, etc. His Eminence wants to send us overseas right away, and we will probably be abroad in Jerusalem or Armenia for at least a year or two. We are trying to stay focused in the midst of many distractions. My mother nearly died late last year; Marsha’s father just got out of the hospital with a heart ailment. My employer, Xerox, just laid me off in January! God is evidently testing my resolve and trying to teach me to trust Him more than I have. As always, we are in God’s hands. Interviewer Arlene Boyd is a graduate student of theology in Berkeley, CA. Prior to graduated studies, she was Program Coordinator at St. Nersess Armenian Seminary, New York. Eighteen parishes are having 32 events, from October 1 to December 31, 1994. There are 17 dinners, 13 bazaars, (that is, 32 opportunities to taste Armenian food), 4 cultural events (a lecture,a book fair, a jazz concert and a talent show), 2 celebrations of Armenia’s independence, 1 fur and leather sale, and 1 seminar on Halloween’s satanic nature. For October 8, she finds two dinner dances taking place in the New York area; on November 12, two bazaars taking place at the same time; and on November 26, two more dinner Kef nights within miles of each other. Overwhelmed by these events, she tries to make sense of these numbers. She calculates that 81.5% of the events are dinners and bazaars, 16% are cultural, 2.5% educational. This is how Armenian parish life is presented in the Armenian Reporter International for a three month period. Of course these numbers are not conclusive. There are other types of activities that go on in Armenian parishes – Bible studies, Sunday School, adult education classes, etc. However, it is interesting to note that during the above mentioned period, not one religious activity was announced. There could be many reasons for this. Our purpose in this brief survey is not an attempt to find scientific correlations or implications of numbers, but rather to present what is already obvious, i.e., the news releases and announcements that are sent by the parishes to the Armenian media. We are not questioning the validity or representativeness of these numbers, we leave that to a more scientific study of these issues in the future. Our purpose is to provide some data for reflection, analysis and discussion. We hope that this survey will provide an opportunity for our parishes to evaluate and scrutinize their overall parish activities and mission. After all, it is not only non-Armenians who are interested in becoming part of the Armenian parish – there are many Armenians who are searching as well. CATEGORIES: 1Banquet, 2Baazar, 3Cultural, 4Educational. The second area of concern is diakonia [service]. Diakonia is an integral part of the mission of the church. Many of our churches are doing diakonic work – for instance, we are doing this in Lebanon. However, this is not well organized on a large scale. What we need is to give a new dynamism, a new creativity and new structural, organic manifestation to the mission of the Armenian Church. This is particularly important in Armenia today. By saying this, I am not criticizing anyone. I am just stating the facts. Today, the Armenian Church in Armenia is not well organized to do diakonia. I have to say this. We need to take this matter very seriously. Besides education and diakonia, we need evangelism. These three aspects of church mission are interrelated and compliment each other. The evangelistic dimension of our churchly existence is of crucial importance. In fact we have lost our sense of evangelism. Preaching, teaching, praying are part of evangelism. But we have lost our true understanding of this. Today, both in Armenia and the Diaspora, we need to reevangelize our communities, giving them a sense that they are a part of the wider Christian community – a sense of belonging to Jesus Christ. For instance, our sermons have become very nationalistic, I understand this to a certain extent, however not at the expense of the spiritual or evangelistic mission of the church. In our sermons we have to teach the Good News. As with Jesus Christ, the Good News had a political dimension, and in our church the nationalistic dimension should be there, however, we should not put the emphasis on the political aspect. The church has to become a church. by Fr. V. N. Nersessian, Ph.D. Following the death of His Holiness Vazken I (1955-1994), the thoughts of the Armenian people are once again turned to the likely profile of the next Catholicos – needed to lead the Armenian Apostolic Orthodox Church into the next century. Certainly, the role and remit needs to be redefined, because the world in 2000 and beyond will be very different from the one Vazken I was raised and operated in. The plaudits won by the deceased pontiff for his efforts in the repatriation project and as peacemaker are no longer required in the new world order. Armenia and Armenians have inhaled freedom and wish to apply their new found political emancipation to their spiritual lives. On the battlefield, where communists squared off against capitalists, we now find progressives lined up against conservatives. In order to ensure that this war of ideologies claims only a handful of casualties, the new Catholicos will have to reconcile the traditionalists’ concern for authority with the progressives’ need for change. As the barriers between the church in the homeland and in the Diaspora are dismantled, as the global Armenian community becomes every day more evident, the one hundred thirty first Catholicos will have to be conscious of this rich potential and be capable of channeling the diverse forces of his global church into a solid base. If the new Catholicos exerts a centripetal force on the Church, he must be aware of ignoring its outposts. In this light the new Catholicos must restore the collegial spirit of the church, allowing greater say to the bishops’ synod, where issues of pastoral significance are debated. Under the leadership of the previous Catholicos this participatory approach was stifled. His successor must ensure that it is revived. The past decade in our Church’s history was dominated by a single project evaluated by a leading church figure of blessed memory as the well being of Holy Etchmiadzin as a “physical plant”. A building project was pursued with a mechanical consistency that veiled an incapacity for fresh thought about the problems of the nineties and beyond. The episcopacy’s failure to exercise its corporate responsibility – and to suggest and devise an alternative strategy for the Church – is also too apparent and thus we find the Church drifting rudderless. The hollowing out of the collegial ethos may prove to be the most damaging legacy of the past half century. Of the forty-five candidates (see Window, vol. IV, 2, 1994) forty-four were consecrated by Vazken I and owe their position and allegiance to him. A great number of them – with spin tingling audacity – are solemnly canvassing in unprincely haste for the throne of St. Gregory the Illuminator. The service ethic, which Vazken I encouraged follows very closely the example of the nobleman who entrusted his kingdom to a group of functionaries. These clergy – with the support of lay lords and collaborative stake-holding affiliations – devoted their total energy exclusively to climbing the greasy pole of patronage. Taking advantage of situations, (the earthquake, the political upheaval in Armenia, the conflict in Kharabakh), and with various partisan ideologies, the mission of the Church was advanced by aid ferrying, airport tarmac photo opportunities and publicity hungry bishops and archbishops. Thus, this generation of bishops and archbishops moved through the ranks under the patronage of lay benefactors with an ease as impudent as it was embarrassing. No job was subject to termination, and candidates were rewarded for past duties, rather than because of their fitness for the post. While those who did not succumb to champagne spirituality were dismissed, condemning them to fulfillment outside the monastery walls (Gospel of St. Luke 19:1-25). In this definitive hour in our church history, I keep churning in my mind the words, “… if salt has lost its taste, how shall its saltiness be restored?” It is hoped, that, when the time comes to elect a new Catholicos, the candidates and the delegates will remember the words of the Apostle, “for it is fitting that we should have a high priest, holy, blameless, unstained, separated from sinners”. (Hebrews 7:26). The Rev. Fr. Nerses V. Nersessian is the Curator responsible for the British Library’s collections in Armenian and other languages of the Christian Middle East. He is a priest in the Diocese of the Armenian Church of England. Recently, Fr. Nerses’ encyclopedic bibliography of sources on Armenia and Armenian studies was published in Oxford by Clio Press (1993), where he provides 880 listings of books and articles with a short annotation of each work. With the passing of His Holiness Vazken I, Catholicos of All Armenians, an era came to an end. Within a few months a new Catholicos will be elected and the future direction of the Armenian Church will be at stake. If you missed the last issue of Window, don’t miss this opportunity to read this informative issue. See back cover for ordering instructions. Ask for Vol., IV, No. 2. Bulk rates available for multiple copies. ◊ Pontifical Election and the National Ecclesiastical Assembly: How will the next Catholicos be elected? What are the procedures? ◊ Pontifical Statistics: Of the 140 chief bishops of the Armenian Church, how long were their tenures? How did Vazken I rank among his predecessors? ◊ The Candidates of 1994: Who are the bishops who will be contending for the pontifical throne of St. Gregory? A look at the slate of 45 candidates for Catholicos. ◊ exclusive Interview with His Holiness Karekin II: Candid comments by the Catholiocs of Cilicia regarding the Mission of the Armenian Church today. • Most material in Window is copyrighted and protected by International copyright laws. While we appreciate the need to share the information found on these pages, and while we are flattered by these good intentions, we remind readers that Window is a costly venture. Our philosophy is simple: if our work is of value to you, support it. We do not operate Window by having dinner/dances, bingo games or raffles. At ACRAG, we have made every effort to provide additional copies at fair and affordable prices. We have bulk prices for churches, Bible Study and discussion groups. We have also made provisions for churches and institutions to legally copy material with proper citation. Contact ACRAG for details and prices. Thank you for your continued support of Window. The Armenian Church is making new roads on the Information Superhighway with the availablity of the Window on the Internet. The Armenian Church Research and Analysis Group (ACRAG), publishers of Window have joined forces with the St. Andrew Information Network (SAIN) to make Window available through the SAIN archive server. Electronic subscriptions and downloading of past issues are now available from any site on or connected to the internet. Internet access is available world wide through government agencies, private businesses, universities and subscription services such as CompuServe, America on Line, GEnie, and Delphi. With a population of over 22 million people and growing at a rate of 10% per month, the internet provides a means for information dissemination. ACRAG is proud to be a part of this growing community.